With Halloween right around the corner, the scariest thought for many parents may be the idea of their kids eating all of the candy collected from trick-or-treating. Well don’t despair. Your Eugene family dentist wants you to know that it’s possible to be mindful of your child’s oral health and still allow them to enjoy their hard-earned candy. While the old adage about sugar causing cavities isn’t entirely true, there’s a reason why candy and cavities are closely connected. The process of tooth decay works like this: Most all types of foods – roughly 90 percent – contain either starches or sugars that enable the harmful bacteria found in plaque to produce substances that destroy tooth enamel. When these attacks by plaque acids last for longer than 20 minutes, they can begin to lead to the loss of vital minerals in tooth enamel and – eventually – lead to the development of cavities. What this means is that a child who sips on sugary beverages all day or who licks on a piece of hard candy every couple of minutes has a much higher risk of developing tooth decay because continuous snacking causes acid attacks on teeth throughout the entire time they remain in the mouth. Therefore, one way to limit tooth decay would be to allow your pint-sized Spider-Men and Wonder Women to indulge in Halloween candy only during large meals like lunch and dinner rather than as a snack. When we eat larger meals, the mouth naturally produces more saliva, which helps to wash food particles and sugars from the mouth. When eaten as a snack, those same residual sugars linger in the mouth providing plaque with all of the fuel it needs to produce plenty of harmful acid. So by limiting candy to during larger meals only, you can successfully lower your child’s risk of decay. Of course kids still get hungry, so choosing the right kind of snack is important to help lower their risk of decay. Research conducted by the Forsyth Dental Center has found that some sticky foods clear the mouth faster than less sticky foods – posing a shorter window of acid attacks on teeth. Caramels – for example – dissolve more quickly than crackers, potato chips, bread, dried fruit, and breakfast cereals. So if you just can’t say no to giving your kids a sweet snack, just consider the type of candy an important part when puzzling out what they should eat. Another option when it comes to all of that Halloween candy is to allow snacking immediately after trick-or-treating, then to donate the rest to charity or participate in a candy buyback program. Just keep in mind that depriving your kids of candy will only make them want it more. This makes moderation a much more effective strategy for protecting your kids’ oral health than to simply state that candy is off limits. While diet plays an important role in helping to protect a child’s oral health, preventative dental care and daily oral hygiene play an important role as well. Just as with adults, kids need to brush their teeth at least twice a day for two minutes each time they pick up their toothbrush. Kids also need to floss daily to remove food and plaque from areas of the mouth a toothbrush cannot reach – between teeth and below the gum line. 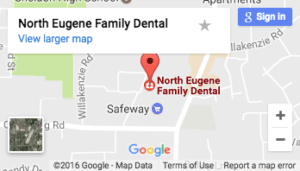 Finally, enjoying quality oral health also requires scheduling regular exams and cleanings with your Eugene Family Dentist. At Northwest Eugene Family Dental, our team of gentle dental hygienists and experienced dentist can help to protect your kids’ oral health now and into the future. So don’t let the idea of trick-or-treating cause you any dread, and remember these helpful tips so that this year your family enjoys a Happy Halloween.